4x7 Customized Indoor Magnets 55 Mil Square Corners are excellent when it comes to showing off your brand information before customers and clients for a long period. All businesses and brands aiming for longer promotions can utilize these custom rectangle and square magnets without doubt. They can also be used for holding pictures, loose papers and posters against metal surfaces like refrigerator doors, lockers and any metal surface in the indoor. 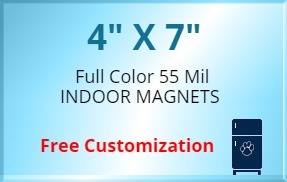 Order these custom magnets Made In USA quickly to get free design, no set up fee and free shipping in the Contiguous USA. Request a quote to know the value savings that you can avail on bulk orders of 4x7 Customized Indoor Magnets 55 Mil Square Corners.